Warkworth is widely recognised as the most picturesque village in Northumberland. An all-year-round destination, it enjoys a unique position; encircled by the beautiful River Coquet yet within walking distance of one of the finest beaches on the Heritage Coast, giving it both a coast and country feel. Many of our cottages are located here and just outside of Warkworth village (click here) and we also have cottages nearby at pretty Lesbury village, Alnmouth, Alnwick and the fishing port of Amble. The village itself is well served by several great authentic pubs, restaurants, boutique-style shops and art galleries, good cafes – including a French Patisserie, ‘Cabosse’ – and art galleries and is centrally placed, making it a perfect base for discovering all of the beaches, islands, castles, historic houses, gardens, cities, towns and villages in the ‘Secret Kingdom’ of Northumbria. 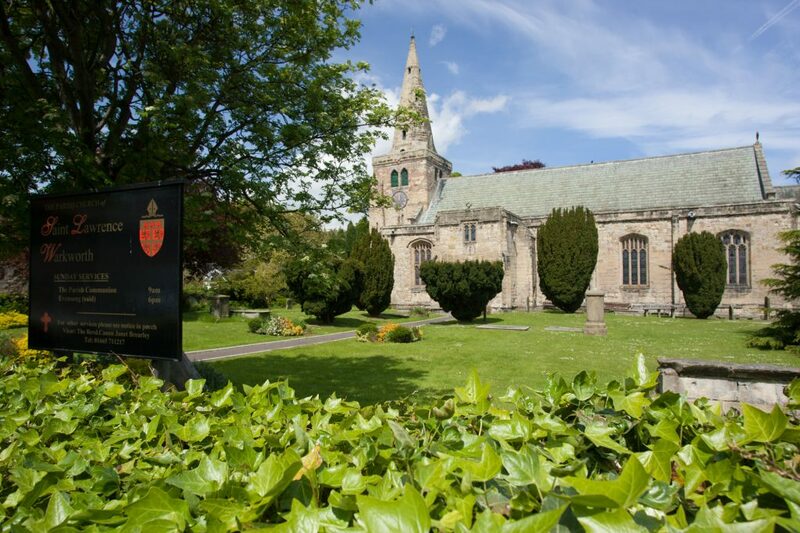 For such a small village Warkworth has a wealth of choices for dining out – from cafes and ice cream parlours to fine restaurants – ranging from the traditional to more contemporary, there’s something for everyone of all ages and tastes in Warkworth. This fabulous little boutique B&B recently opened their dining room up transforming it into a little bistro on Friday and Saturday nights, and it’s a very welcome addition to the village. Popular with locals and tourists alike with its ‘Michelin Star-quality’ food, it is recommended you book as far in advance as you can to secure a table as it’s so popular. They also cater for private parties if you are coming on holiday with family for a special occasion. Tel: 01665 711341, or click here for the website. Very good quality food, freshly prepared and sourced locally, served in an elegant and very traditional restaurant. We can certainly recommend The Jackdaw, especially for a lovely Sunday lunch, a romantic occasion or just a lovely evening meal. They welcome children but you might find it harder with smaller children, as it has a quiet and slightly formal feel to it, which is nice for adults but kids may get itchy feet! Ring to check opening times as they vary throughout the year and you usually need to book too. They have no website but their telephone number is: 01665 711488. On the road to Acklington from Warkworth about 2 miles out, Morwick ice-cream is absolutely delicious! Housed in a converted part of the milking shed, it’s a delight to enjoy a gourmet ice-cream whilst watching the beautiful award winning pedigree Ayrshire and Holstein cows milling around. There’s a very good little adventure playground for smaller children too, directly in front of the ice cream parlour, making this a great stop. Highly recommended and definitely worth stopping off for! Tel: 01665 711210 or click here for their website. A quaint cafe located in the very centre of the village. Serving home-cooked lunches from an extensive menu and fresh cream cakes and desserts, their window display of cakes will doubtless tempt you in! Tel: 01665 711338, or click here for their website. They have a comfortable and attractive bar that allows dogs too, as well as a lounge area you can relax in. The restaurant has recently been completed refurbished too, and the food is excellent! We recommend booking to avoid disappointment, especially in busy times. Tel: 01665 711276, or click here for the website. Located at the top of the village opposite the castle, The Sun Inn is a cosy pub, popular with the locals, with a food served in the bar. Dogs are welcome in the bar. They have a steak restaurant open Tuesday to Saturday called No. 6 Steak House located in the lovely conservatory with views of the castle and the estuary. They have live music on regularly, usually on a Saturday evening and also a great juke box! Tel: 01665 711259, or click here for their website. Probably the most atmospheric pub in Warkworth, serving good pub food in a nice setting right in the centre of the village. They serve hearty food each day and Sunday lunch, you can even take your dog with you too. They occasionally have live music on during the year, so keep an eye out on their website. Their quiz nights on a Tuesday are popular too, starting at 9pm. They have a huge beer garden that’s all been recently refurbished with a pizza hut and more, which is a sun trap too. Tel: 01665 711398 or click here for their website. This fabulous French patisserie is owned and ran by renowned Chocolatiere, Louise Frederique, who is famous for her gorgeous handmade chocolate creations made with fresh cream and a range of imaginative fresh ingredients. As well as chocolate creations, she also sells delicious sandwiches, savouries and pastries to take home (or eat straightaway if you can’t wait!). A perfect addition to the patisserie is a lovely little cafe situated to the rear of the shop, selling a range of excellent coffees, teas and of course, savouries and pastries lovingly hand-made on the premises by Louise. Her velvetty smooth hot chocolate is absolutely unmissable! Click here for the website. A fabulous contemporary cafe created from the conversion of an old pub, Bertram’s is incredibly popular at all times of the day and is open from 9am-7pm 7 days a week. Dogs are allowed in the front part of the cafe and the pretty courtyard outside. Serving fabulous food with everything from traditional Northumbrian fare such as Kipper Pate through to more contemporary dishes such as Eggs Benedict as well as the best Afternoon Teas in the area. Bertrams is perfect for a coffee or home made Cullen Skink soup after a long walk on the beach, or even an early evening meal with little ones. It’s licenced too if you fancied something stronger than a coffee! Tel: 01665 798070, or click here for their Facebook page. Over 5 miles of golden sandy beach backed by huge dunes is waiting for you to explore! Reached by turning up a steep road just after the bridge, you can easily walk there or take the car and park up (for free), then the beach is a couple of minutes’ walk after that. There are no restrictions for dogs on the beach (or any of the beaches in North Northumberland) all year round. This is not a crowded beach at all – even in the summer months. The beach is easily accessible from all of our cottages in Warkworth. The Mill Walk goes all the way around the Coquet River starting from the end of The Stanners. 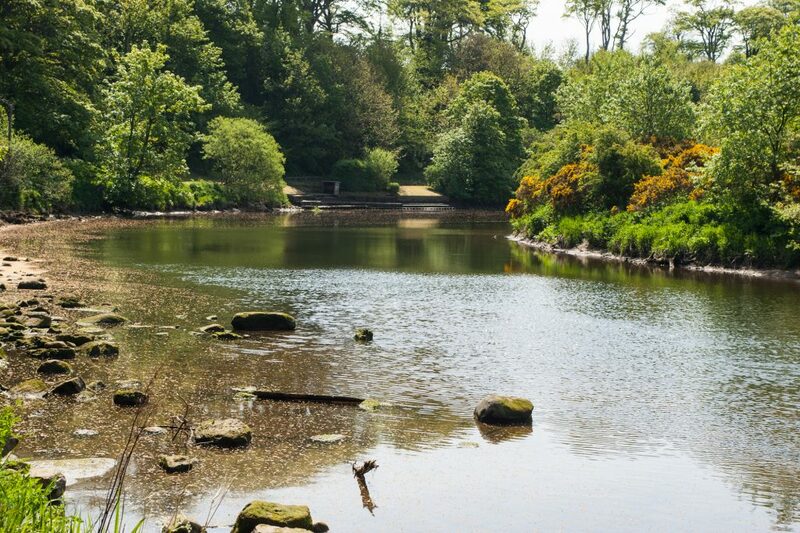 During this walk you can take in some stunning wildlife, such as Heron’s positioned along the riverbank, leaping salmon, otters, kingfishers and the occasional seal bobbing along the river! The walk ends at The Hermitage, where you will then walk up towards the village and round to the castle. This walk takes about 30 minutes – a lovely start to a morning or a tranquil evening walk! Amble is very easy to reach on foot from Warkworth. By heading south out of the village, you walk along the Coquet Estuary and will undoubtedly see an abundance of wildlife – look out for the seals! Why not walk to one of Amble’s lovely restaurants on a mild evening or have a wander down to the Amble Harbour Village boutique shopping Pods and the Sunday market down by the Quayside. If you walk along The Braid, you can stroll through the marina itself and on to the harbour to see the fishing boats coming in with their daily catch – depending on how early you are! When the tide is out, you can see the old ship wrecks in the harbour which is really interesting. Alnmouth is 3.5 miles north of Warkworth, along the coast. There is a great cycle route from Warkworth to Alnmouth which is very popular with cyclists and walkers alike. You begin by heading up towards the beach then turn left and follow the cycle route signs. You can finish your walk with a drink or meal at one of the pubs in Alnmouth – you can also take your dog into The Red Lion and The Sun Inn. A beautiful art gallery selling original artwork, sculptures and jewellery and highly recommended. Family owned, Dorien and daughter Nicole are accomplished artists, there is a wide range of their beautiful work for sale and they carry out commissions too, as well as artworks from other local artists. Something handmade from the gallery would make a wonderful souvenir or a gift for someone at home. Click here for their website. An incredibly popular little shop selling scarves, jewellery, handbags and all the gorgeous accessories you can think of! You’re bound to come home with a beautifully wrapped Gray’s gift after your holiday, as everything is irresistible and very affordable. Not forgetting the men too, they have a range of jazzy men’s shirts, scarves and watches, which make an ideal gift. Click here for their website. Like a tardis inside, every space is filled with interesting gifts and things for the home. The Greenhouse offers all sorts of lovely ornaments and nik-naks to take home as gifts or for your home. It’s located right in the centre of the village – you can’t miss it! See their website here. As well as having a quaint café to the rear of the shop, Cabosse first began as a small patisserie. Louise Frederick, the Chocolatier produces beautifully crafted handmade fresh cream chocolates and sculptures, as well as a range of cakes, pastries, petit fours and sandwiches. In the summer they have ice cream and in the winter their homemade hot chocolate is to die for, we would definitely recommend popping in for one! Click here for their website. Located in the centre square of the village, this is the only convenience store in Warkworth. They sell fresh bread from the local artisan bakeries in Amble and Rothbury, as well as sandwiches, magazines, confectionery and the usual basics. They also have a selection of local produce such as kippers, jams, chutneys and cakes. There is a small post office located in the Village Store too. There is no website but it’s located right in the centre of the village square and is very easy to find. Each year the village have a very interesting Village Show usually on the 2nd or 3rd weekend of August. This includes competitions between the locals for the best cakes and the biggest vegetables, all on display for the public to see with an auction to bid for them at the end of the judging. There are also a few lovely stalls with local produce and arts and crafts to buy, a fun run and a dog show. It takes place in and around the grounds of the castle. On the 3rd weekend in November each year (usually but do check with us as some years the date is brought forward), the village has a Christmas Shopping evening, where the Christmas lights around the village and on the Christmas tree are turned on and all of the shops are open until late, offering festive nibbles and mulled wine. The Church opens up to hold their annual Christmas fair too, which is lovely and very much a community event. It’s a lovely evening, ideally topped off with dinner in one of the lovely restaurants in the village – but book in advance, it’s very popular indeed! In the nineteenth century the village held three fairs for livestock sale, in May, August and November. Races were held here in May each year, and there was a three-day feast in August. Population figures for the first half of the nineteenth century show a steady increase in numbers. In 1801, 614 persons are given as residing in Warkworth; by 1841 this had grown to 785 persons, and by 1851 the population stood at 834 persons. The village today is a popular place to visit, particularly in the summer months; its picturesque environment and colourful past making Warkworth a desirable destination on many a tourists’ holiday route. Warkworth has a long and interesting history. The parish Church of St. Lawrence is Norman in origin and is the best example of Norman architecture in Northumberland. It’s situated at one end of the village with its dominating spire of nearly 100 feet in height. There has been a Church on this site for around 1,200 years. The first record dates from 737AD when King Ceolwulph of Northumbria gave the Church and village to the Abbot and monks of Lindisfarne. The Church was built as a place of worship and a place of refuge in dangerous times; the nave is thought to be the longest Norman nave in the county. In the graveyard can be found the tomb of a 17th C Royal Huntsman. The blackest day in the history of Warkworth Church occured on 13th July 1174, when the Earl of Fife, accompanied by King William the Lion of Scotland, put to death 300 Warkworth residents who had sought refuge in the church. The old, now pedestrianised stone bridge over the River Coquet dates back to the 14th century and is one of the very few in the country to have been fortified with a tower, which is believed to have been used as a jail. 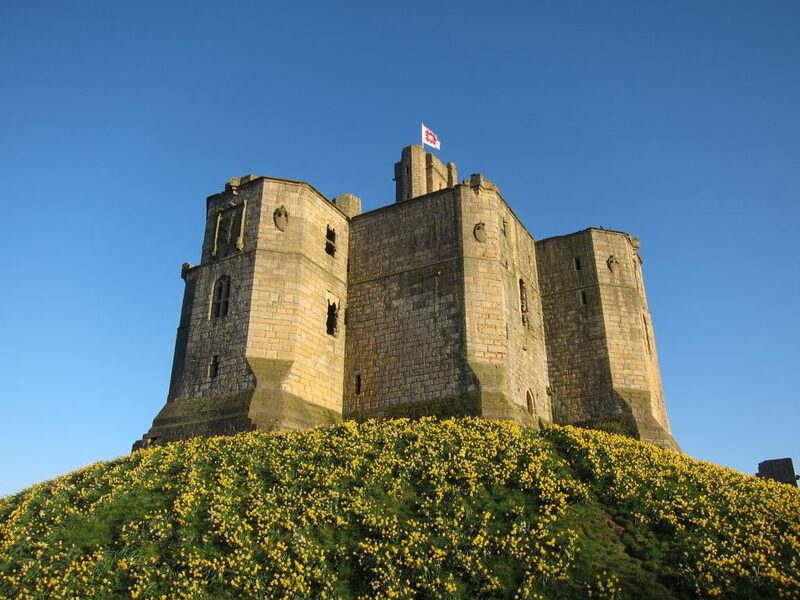 Pevsner said that approaching Warkworth from the Alnwick road represents the most exciting sequence of views in England, seeing the keep of the castle rising majestically from the winding Castle Street. Warkworth used to have a railway station, which is on the main East Coast line, but is actually 1.5 miles from the village. It seems strange that it was ever built really, as the village was relatively far away from it! It was built in 1847 and finally closed in 1958, with very little passenger traffic. It’s a grand building – grander than was befitting the low volume of passenger traffic. It is still there, but in residential occupation now. Its history is fascinating however, and well worth investigating. Click here to read more about it. At the other end of the village, Warkworth Castle sits majestically atop a hill, visible for miles around. This castle is the ancient seat of the Percy family, Earls and Dukes of Northumberland and dates from the 12th century. The first building is thought to have been a wooden construction, built by Henry, the son of King David I of Scotland, who owned the land at that time. Henry had the title “Earl Henry of Northumberland” at a time when the North of England was part of Scotland. It is remembered through Shakespeare’s Henry IV and popularly believed to be where Hotspur set out from, to travel to Shrewsbury and his death. In 1158 Henry II gave the castle to Roger Fitzrichard who most likely began to rebuild it with stone. His son Robert continued to improve and add to the buildings. Years later, Edward III granted Warkworth and its Castle to Henry de Percy II in 1332. The castle passed back and forth between the Percy family and the Royal family for centuries. The cost of maintaining the castle is enormous so the Duke of Northumberland passed it to the nation and it came into the custody of the Office of Works in 1922, who then later passed it to English Heritage. Today the castle is still owned by English Heritage and is a popular venue for local events and outdoor theatre. Interesting for all ages, children love to play within the inner grassed area, with toy swords on sale in the little visitor shop, they can pretend to be knights for a while! For older visitors, the audio tour here is particularly good and well worth taking the time to find out more about the castle’s history. On the other side of the river below the castle, is a chapel carved in stone which can only be reached by boat across the river. Known commonly as ‘The Hermitage’, is was also known as the Chapel of the Holy Trinity. 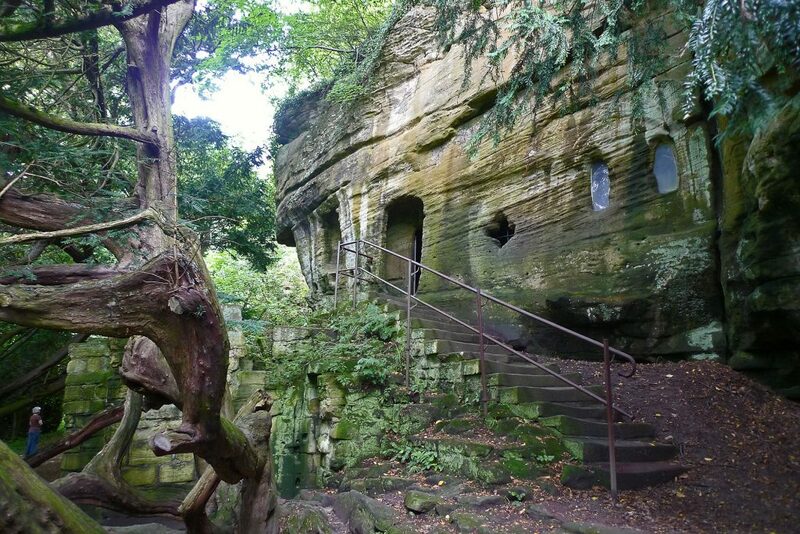 The Hermitage is situated in a peaceful place, overshadowed by trees on the north bank of the River Coquet, a few hundred yards from the castle at Warkworth. It is in the part of the Manor of Warkworth once called Sunderland Park, and was built as a chantry chapel in the period 1332-49, by Henry Percy II, son of the first Percy, Lord of Alnwick, although some of it was built at a later date. Walking the path from the castle, reaching the landing stage and hailing the ferry, you enter a world of romance and intrigue. Guidebooks cannot convey the romance of the place and being there brings a sense of peace and serenity. Walking slowly up the path through the trees, past the ancient spring on the right, you enter under the yew tree into the twilight world of The Hermitage. The origins of the chapel are not precise, facts place it as 14th century, established as a chantry by a Percy lord. However romance has it being created by one Bertram of Bothal as a penance for having accidentally killed both his beloved Isobella of Widdrington and his brother in a rescue against Scottish kidnappers. This tale was edited and published in the 18th century by bishop Percy. The story is fascinating but holds very few true facts, other than that the bishop wished to prove himself as one of the noble family, but could not to their satisfaction, as he was born of trades folk from Bridgenorth in Worcester. It is also said that Harry Hotspur’s son, landless and living in Scotland after his father’s abortive attempt to overthrow Henry IV, secretly married Eleanor, daughter of the powerful Nevilles, in the chapel. In fact the two did marry after he regained his rightful place. The first record of anyone living there was in 1471, when the chantry living was given to Thomas Barker, in order that he might say prayers for the Percy family. In 1506, John Green took over the post, then followed Edward Slegg in 1515. The last incumbent was George Lancaster in 1531. George also became the agent for the park as at this time life was not so certain for the Percy’s and in 1536, the chapel and living were abandoned, as the catholic religion was not popular, particularly as the Percy family were involved in The Pilgrimage of Grace against Henry VIII. It was during the 15th century that the Hermitage was extended, adding the living accommodation on the lower level to the original hewn out chapel and it was, it is believed, during Edward Slegg’s time that it became known as the Hermitage, as in the parish records he is listed as “The hermit in residence at the Chapel of the Holy Trinity in the parks at Warkworth”. First constructed in the early fourteenth century, the Hermitage consisted of three chambers hewn out of the rock. Later in that period, rooms were added to the face of the cliff, these were altered about a hundred years later. The ground floor, partly set under the overhang, has a central doorway with a small internal lobby. To the left was the hall 4.6m by 5.5m, with a fireplace, a large window facing the river, a small window commanding the entrance, a cupboard and a door at the northeast end opening from a two storied annex which appears to have been a later addition. The jambs of the lobby doors are scarred where tools or weapons were sharpened there in the past. To the right of the lobby is a doorway now blocked by more modern stonework steps to the chapel. At the base of the steps is the remains of the kitchen about 4.6m square, with a bread oven, the base of which remains. Some kind of passage crossed over the kitchen from the earlier steps, hewn out of the cliff, to the door of the chapel, and perhaps to the door of the solar on the floor above, the stairs to this floor at this point have disappeared. The solar, on the first floor, had a window facing the river, a garderobe (latrine) in the northwest corner, and a fireplace in the south wall. It’s plan is now very irregular as its back consists of part of the much smaller rock-hewn chamber which preceded it, the west end was either removed when the house was built or had fallen away prior to construction. Chapel and sacristy. Climb the steps to this area, both are set parallel with the river at an angle of 45 degrees to the house, they lie southeast-northwest, but for convenience of description they are considered as lying east-west. A miniature porch with a seat on either side leads into the inner door of the chapel above which is carved the figures of Christ on the cross with Mary and John on either side. On the inside of this doorway there is said to have been a shield an object resembling a gauntlet, however there are no traces of it now so it may have been a painted emblem rather than carved; under the shield may have been painted the words FUERUNT MIHI LACRYMAE PANES DIE ACNOCTE which translates to “My tears have been my meat day and night; Psalm xlii:3″. The inner chapel measures 2.3m by 6.2m and is covered by three groined bays imitating vaulting supported by semi-octagonal shafts with moulded caps and bases, all cut from solid rock. The two shafts at the northwest end are unfinished possibly due to Scottish raids in 1341, when Warkworth was sacked, an opportunity to hire fresh workers did not arise before the plague of 1349. Work was finally abandoned in 1352, on the death of Henry Percy the patron of the work. At the east end is an altar with a small cusped recess above it, no doubt for relics; one of the consecration crosses still remains. The altar at present is covered in graffiti some dating to the turn of the 20th century. On your left when facing the altar, is a four-light barred but unglazed window with flowing tracery, which admits borrowed light to the sacristy. To the right of the altar is an arched recess with two single-light windows. In this recess is a curious piece of sculpture representing a reclining woman, her head supported on a pillow and her feet resting against a piscine. In the recess at her feet is the figure of a man in rough garb, in the window nearest him is the head of a bull, and next to that the possible representation of an angel. At her breast is what is believed to be an infant, the whole may be a Nativity, however due to it’s poor state this is just conjecture as other theories have been put forward; from it being Isobella to Hotspur’s mother, and as there are no records from the period in question it is a case of making ones own mind up. In the centre bay on the south side is a quatrefoil opening with a bowl cut into the inner sill. On the north side are three narrow trefoil headed slits forming the front of a squint which allows the chapel altar to be seen from the west end of the sacristy. The west bay of the chapel has a doorway to the sacristy, opposite the entrance. Above it is a shield bearing the Instruments of the Passion, with the text once visible; Dedernt in escam meam fel; et in siti mea potaverunt me aceto”. Translated means “They gave me gall for my meat and in my thirst they gave me vinegar to drink. Psalm lxix: 22”. The sacristy measures 1.6m by 8.5m, which includes a lobby once screened off at the west end, in its walls are two recesses the smaller one a cupboard, the larger one may be a bed recess from the original chantry. There is another altar at the far end of the sacristy with part of the wall cut away. It is possible that during the Reformation when places like this were banned, officials came here to take away any valuables and finding none rapped on this wall, getting a hollow echo, believing there to be a room beyond they cut the wall away. The sacristy ceiling is plain, rib-less, barrel vaulted. The whole interior was decorated in white and other colours, traces of paint were still to be found in the nineteenth century. The now open end was once enclosed and there are traces of steps and a doorway. We will never know what the Hermitage looked like in its day, but by using our imagination we can see more than is visible to the eye today. This fascinating tale was immortalized by Bishop Thomas Percy in his ballad The Hermit of Warkworth, written in the eighteenth century and dedicated to Elizabeth, Countess and later First Duchess of Northumberland. Click here for more history and interesting facts about The Hermitage. Click here for English Heritage’s website to view opening times. Just opposite The Bridge Barn's garden is the Millennium Garden which is very pretty and planted seasonally by the village council. Telephone: 01665 710 700 or click here to email us with your enquiry.